Use our Extended Stay Las Vegas promotional code for a $50 discount at any of the three Extended Stay America hotels in Las Vegas when you stay for seven to fourteen nights. The code should be entered automatically, but just in case, it’s M7X50. p.s. If you are only staying two to six nights, change the promotional code to M7X20 for a $20 discount. Extended Stay Las Vegas Valley View is located at 4270 S Valley View Blvd. Valley View Boulevard is about one mile West of The Strip, off of Flamingo Road. The Extended Stay America Valley View hotel is kind of located behind The Palms Casino Resort. Maybe you can sneak on the Palms free shuttle to get to The Strip (shhhhhhhh!). Extended Stay Las Vegas East Flamingo is located at 1550 E Flamingo Rd, about two miles East of The Strip. This Extended Stay America is very close to the University of Nevada Las Vegas UNLV, if any moms and dads want to stop by and keep an eye on their little tuition gobblers. 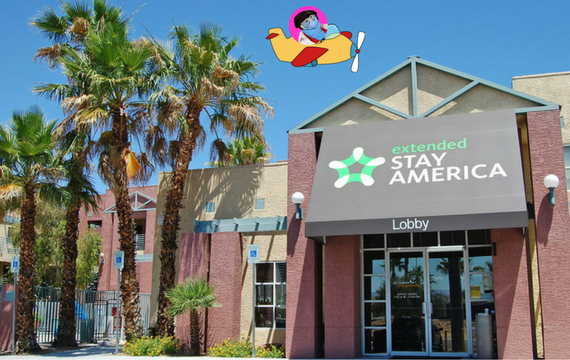 Extended Stay Las Vegas Midtown is located at 3045 S Maryland Pkwy. This Extended Stay America is only about a mile from the Las Vegas Convention Center. If the pesky golf course weren’t in the way, it’d be an even shorter walk to the convention du jour. Coupon Puppet Loves To Save You Money At Extended Stay Las Vegas!